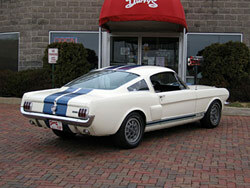 1966 Ford Shelby GT 350. Gorgeous California Shelby with 13,700 believed to be original miles. Strong Boss 302 with inline 4 barrel Cross Boss intake and carb, Top loader 4 speed transmission, oil cooler, pan hard bar, rear sway bar, rear shelf, roll bar, rear battery, and lowered A-arms. Original Shelby 10 spoke aluminum wheels with P235 / 60 R 14 Goodyear Wingfoot radials, excellent bumpers and chrome, Shelby instrument pod with correct 1966 tach. AM radio. 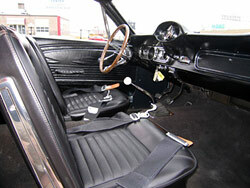 Immaculate original Black bucket seat interior. Excellent Wimbledon White finish with Blue Lemans stripes. 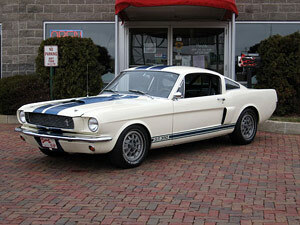 This well documented Shelby is #2310 in the Shelby Registry. This rare, highly desirable Shelby is a must see!